Many aspects of nature are a mystery to science, and at least part of the reason is that nature has been designed so incredibly well. There are systems running in nature that are simply too complex for us to understand and, as a result, their functions remain a mystery. Not all that long ago, for example, many biologists were silly enough to actually think the human genome was mostly junk, simply because they couldn’t understand what the vast majority of the human genome does. Of course, as we have learned more about DNA, we have learned that what was once considered “junk” is vitally important (see here, here, and here, for example). Since the Encode project published its first major results, most reasonable biologists have slowly started to realize what creationists have said all along – there really isn’t much (if any) junk DNA. Animals often produce substantial forces in directions that do not directly contribute to movement. For example, running and flying insects produce side-to-side forces as they travel forward. These forces generally “cancel out,” and so their role remains a mystery. Why would a moving animal expend energy to produce forces that are perpendicular to its motion? Those forces don’t contribute to the animal’s forward motion, and they tend to cancel each other out. As a result, they are often called “antagonistic forces.” Such forces seem like an utter waste of energy. Nevertheless, lots of animals do this. In addition, some animals exert antagonistic forces even when they are not moving in a given direction. Hummingbirds, for example, produce antagonistic forces when they are hovering over a flower. The authors examined the fish with high-speed cameras as it hovered in water that had a current. They saw that the fish would start a wave at the front of its fin and an opposite wave at the back of the same fin. These two waves produce forces in opposite directions, so it seems that one wave is “fighting” the other. For example, lets suppose the fish is hovering in a current that is pushing it backwards. The wave started at the front of the fin pushes forward, fighting the current, while the wave started at the back of the fin pushes backwards (in the same direction as the current). Without any detailed analysis, it seems that the wave started at the back of the fin is working against the fish’s desires – it is pushing with the current that the fish is pushing against! Under high-speed cameras, the researchers were able to see that the fish could rapidly change where those two waves met on the fin. When the current was pushing the fish backwards strongly, the forward wave would take up most of the fin, and the back wave would occupy only a small part of the fin. This would produce a strong force that was mostly forward, counteracting the current and allowing the fish to hover. As the current slowed, the fish was not being pushed backwards as strongly and therefore didn’t need as much forward-pushing force. When that happened, the fish would change where the two waves met on the fin so that the forward wave took up less of the fin and the back wave took up more of the fin. This produced a forward-pushing force that was not as strong as before, because it didn’t need to fight the current as much. If the current stopped completely, the waves would meet at the halfway point so that the forward force equaled the backward force, and no net force was exerted by the fin. But how does that help the fish? Isn’t the force that goes in the same direction as the current wasted? No! If the fish produced only one wave (the one that fights the current), when the current changed, the fish would have to start a brand new wave that produced the force required to fight the new current. The researchers showed that it is much faster and much easier for the fish to change the point at which the two opposing waves meet than it is for the fish to start a brand new wave. As a result, producing two opposing waves allowed the fish to react much more quickly to changes in the current! A tradeoff typically exists between stability and maneuverability. A high degree of static stability would normally result in an aircraft that was easy to fly but had low maneuverability (trainer aircraft, for example). Fighter aircraft designs would incorporate low levels of static stability so enhanced maneuvering capabilities could be achieved. 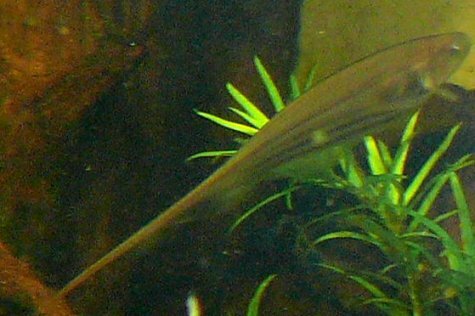 By producing antagonistic forces in its fin, the glass knifefish gets around that tradeoff. It achieves a very high stability and a very high maneuverability at the same time! In addition to challenging the maneuverability–stability dichotomy within locomotion, our results challenge the same tradeoff within the engineering of mobile robots. This may inspire the exploration of a new set of strategies for the design and control of mobile systems. In other words, they suggest that by taking cues from nature, engineers might start producing mobile systems that have two seemingly contradictory traits: high stability and high maneuverability. Of course, this isn’t surprising to me at all. In the end, if you want to build the best system possible, you should steal your designs from the greatest Engineer! Can you tell me if the 98% similarities between the human and chimp DNA are just the 2% portion that codes for proteins or is it the entire DNA strand? If it is just the 2%, are there any plans in mainstream science to go back and compare the two now that we are finding more function to junk DNA? Hi Luis. The 98% number is nothing more than a lie. It was based on a ridiculously small sample, and even though scientists have known better for a long time, many dishonest evolutionists still quote it. Even when comparing just the protein-coding genes, humans and chimps are at most 94% similar. When comparing the entire genome, including what evolutionists used to (and some still do) call “junk DNA,” the similarity is only 70%. The researchers showed that it is much faster and much easier for the **fist** to change the point at which the two opposing waves meet than it is for the fish to start a brand new wave. Great article though – I really enjoy reading your blog Dr. Wile! Thanks, Karsten! I have fixed that typo. Anyone that has played sports or been active physically knows the value of the balance of opposing forces for quick changes in direction. Perfect forward motion is good only when moving perfectly forward.— Like all things in life a balance of imperfect motions is often a better choice.